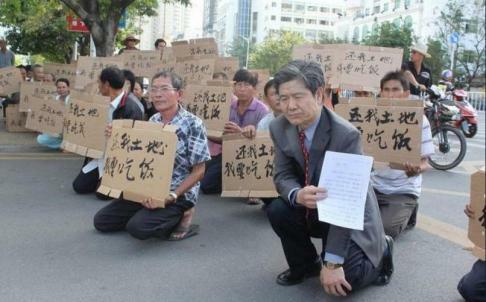 Dozens of farmers in Hainan’s Sanya city knelt in front of government offices last month to protest against a court ruling on a 1991 land seizure they felt was unjust, state media reported on Wednesday. The two parties were embroiled in a two-year-long legal battle after 83 farmers had sued the Yanglan county government for illegally occupying lands that had originally belonged to them as part of a farm collective established in 1958. The farmers accused the government of violating “operational autonomy of the local town government” and had demanded compensation of 100 million yuan (HK$125 million) in economic losses. The city’s Intermediate People’s Court of Appeal threw the case out in October after farmers had failed to sue within the maximum five-year limit. Liu Jingyi, a law professor from Beijing’s Minzu University, joined the protest and said the court’s ruling was based on “gangster logic”. "Imagine someone takes something from your home without explanation and a few years later claims that because you did not inform the police at the time, the things stolen were now legally his. Is this reasonable?” Liu said, quoted by the China Youth news website. According to the farmers, the Yanglan county government forced the farm collective’s head, Lu Qian, to surrender operation and collective ownership rights of the 2,535 acre (10.2 sq km) farm in 1991. Several farmers lost their jobs after the new manager appointed by the government had ran the farm into huge debt and financial losses.